Incredibly striking art deco style sideboard shown here in maple with an ebony crossbanding and inlay. 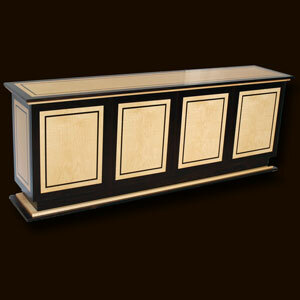 This sideboard exudes the classic art deco style and would make a real statement in any room or office. We are also able to offer this style of sideboard in any size that suits you and make any design changes you wish. In standard form, this sideboard comes with 'push to open' doors and one adjustable shelf in each section. Internal or external drawers could be added - please ask for quote. If you would like to change any aspect of this item or have other design ideas, please call or use our bespoke request form. Available in the woods as pictured or in any of the combinations below!